Cover Art: The first thing that hits the eye is the striking model who is an attractive older gentleman. The color scheme is rich blue. It gives the cover a dark mysterious feel. Blurb: The author introduced the main characters Kevin and Jace. She gives the reader a peak into their history. Main Characters: Kevin “Fitz” FitzGerald, a Boston police officer and adoptive father, finally gets his story told in this novella. He has played a minor role in almost the entire Cold Case Psychic series. Jace Lincoln, a wealthy man who was kept in the closet by a nasty father. He is a philanthropist who runs a homeless shelter. Kevin and Jace are two men who have met before the start of the novella. They do not have an easy path to their happily ever after. 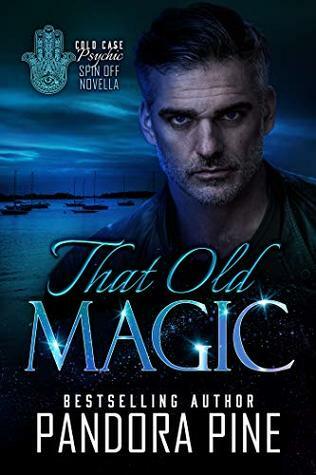 They have reconnected with each and reignited that old magic that brought them together. Their reunion led to a lot of passionate scenes. Minor Characters: There were no new characters. They are all recurring characters in the main series who show great friendship towards Kevin and Jace. Plot: This is a second chance romance with elements of May/December. Writing Style: This novella was well written. I found a lot to love about it. In my opinion, I believe that the author crafted fully fleshed out characters. Kevin and Jace are men who have faults, fears and histories. They are not perfect men. The author created highly entertainable scenes with her characters. Scenes that had both heat and humor, a winning combination in my mind. The dialogue between the main characters and their friends was very well written with a lot of humorous words. Conflict/Climax: Kevin and Jace start their story off with conflict. They desire each other, but are not able to be together. They must fight for their potential romantic future. Conclusion: I loved Kevin and Jace’s story. It had great characters and passionate scenes. For all these reasons, I award this story a 9 out of ten stars! Previous Book Review ~ Vampire’s Vengeance by Pierce Smith … 8 out of 10! Next Book Review ~ The Story of Us by Barbara Elsborg … 9 out of 10!